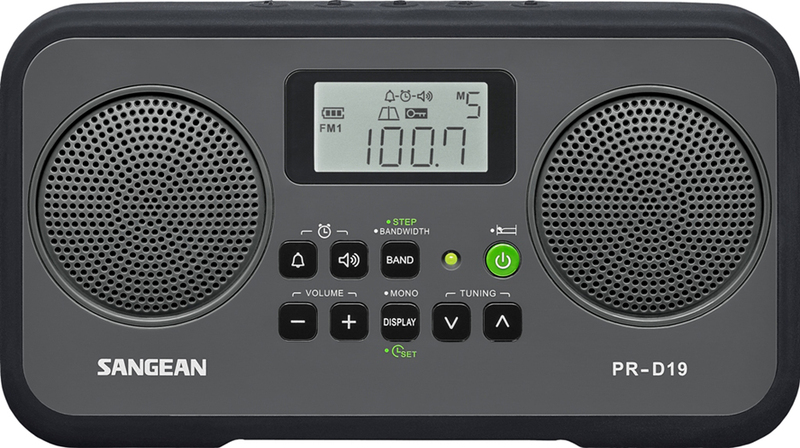 Tom has apprised us of the new Sangean PR-D19 radio, for sell at Universal Radio and Amazon. Price is under $100, a little cheaper on Universal, but you have to buy the AC adapter separately. Even then, it's still cheaper on Universal. I'll be curious how it performs on AM and FM. I wonder how the PR-18 and 19 compare with the 909X on FM. Looks like a cute radio. I generally favour a power button on the top of the set though. These radios tend to be light, meaning you can't press a button from the front without pushing the thing backwards. I wonder how the PR-D19 performs compared to the cheaper PR-D15. For what it's worth I recently got the PR-D18 (the mono version of this, one speaker) and I like it a whole lot. It's not a DX machine, but the sound is great for a radio this small, and it's excellent on FM. I now use it as my everyday radio for general listening, FM and AM. I'm curious as to how the presets work on the stereo version. The PRD18 has 5 dedicated preset buttons, something I find very convenient. But I don't see any preset buttons on the stereo version, which seems to indicate to me that there's at least a 2-step process to access preset stations. That would be a big downside to me. Ken, would you attribute the strong FM to the DSP chip? I assume so. It's more sensitive on FM than any of my non-DSP radios. And, as I said, for a smallish portable radio, the sound is very good, both on talk and music, very pleasant to listen to. Thanks, Ken. I wonder how its FM compares to the 909X's. I am interested in the multiple FM bandwidths. This and the new 405 have a normal and narrow FM selection. Curious to see if it works in the field! Can't find an SiLabs chip with multiple FM bandwidths on their website though. Would be nice an the 909x Series 2 perhaps? It's a temptation, for sure. This and the Sangean 909x. Art Bell returns to live radio tonight; 9 PM PDT/Midnight EDT, 5085 kHz on your shortwave dial. More details at ArtBell.com. Changing the subject slightly to internet radio and the new Amazon Echo. A friend got an Echo (think siri always listening for a command + bluetooth speaker). It hooks into many services, including I-Heart-Radio and Tune-in-Radio. You simple say "Alexa [one of two names you can give it for now] play radio station [call letters, or some way to identify it]." We tried KQRS, and no problem. I tried "89.3 The Current" and it found the station I meant. I tried "WCCO-AM" and it found it. I tried "950 AM in Minneapolis" and it found the correct station (KTNF). I tried "KCCK" and jazz began to play. For those who are into internet radio this is an interesting device. There are no dials, or knobs. You just, from the couch or chair, just say what you want, and the device tunes it. You can control the volume by commands as well. You can tell it to mute (so still streaming, just muted). You can tell it to stop. It has many other functions as well, but I found that I really enjoyed using it as a voice-activated way to play music (it will also access some standard music services such as Pandora). It can set alarms, timers, add items to a to do list (which you can see on an app on your phone). Add stuff to your shopping list. For radio use, I would point out the current firmware does not support any sort of sleep timer. I've read several forums of other users who think this would be useful. I keep in mind that this is really a product that is in its infancy, and features will be added all the time going forward (hopefully and if is successful). It's not a cheap device, but it is rather novel, and I think some will take to it quite readily. As I said this was all via a friend's Echo, but I know have one on order as well.